Wow this stuff is addicting. 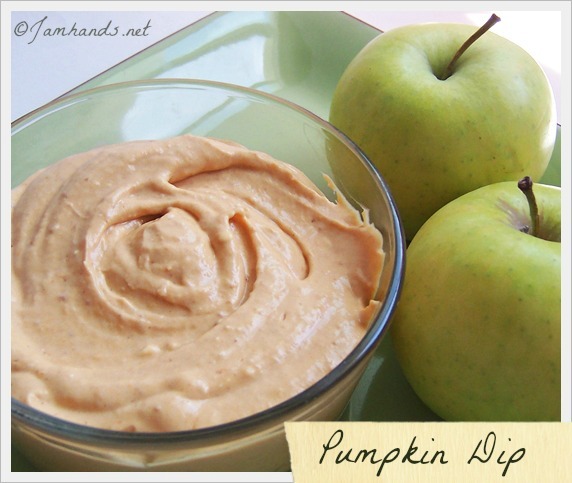 I just ate both those apples and am now wondering what I could possibly dip in this incredibly yummy pumpkin dip. Hmm...cookies? I'd better go try. This would be perfect for a party alongside a tray of apples and misc. fruits to dip with. Better yet, it is kid friendly and a Cooking Light recipe! 1. Place first 3 ingredients in a medium bowl; beat with a mixer at medium speed until well blended. (I whipped for about 2-3 minutes, to get it nice and fluffy) Add syrup and cinnamon, and beat until smooth. Cover dip, and chill 30 minutes. Serve with apple. This would be great with Gingersnaps! Oh my that looks delicious!! I must make it for my playdate later this month!! Yummm! Thanks! This sounds scrumpous, hope I spelled that right, lol, well, very, very good. This looks and sounds so yummy! I am going to make this for our family reunion next weekend!! !